2019-04-18, ASTAP ß0.9.202 Added saturation adjustment in pixel math. Renamed "bright star colour filter" to "smart colour filter". Replaced smooth filter for LRGB by "smart colour filter." 2019-04-17, ASTAP ß0.9.202 Cosmetic improvements only. 2019-04-15, ASTAP ß0.9.201 Fixed a major bug in the alternative background calculation for astrometric solving. 2019-04-14, ASTAP ß0.9.200 Improved the execution speed a little. 2019-04-14, ASTAP ß0.9.199 Big improvement in AstroC demosaic method. Move demosaic preview option to pull down menu viewer. 2019-04-11, ASTAP ß0.9.198 Added keywords cwhite, cblack to header. Some internal cleanup. 2019-04-6, ASTAP ß0.9.197 Fixed a problem with applying dark and flats when selecting multiple images series. Prevent deepsky annotation overlap. 2019-04-4, ASTAP ß0.9.196 Added the possibility to add the object position using the deepsky database. Double click on RA position in viewer. Intended forJPG, PNG files as start point for solver. Fixed several other small things. 2019-03-28, ASTAP ß0.9.194 Modified PlateSolve2 behavior. If you select in SGP the PlateSolve2 setting "Max Regions" (=3000) this will force a search up to 90 degrees diameter. However the solver will be most likely stopped halfway by a SGP timeout. Improved DEC format in popupnotifier. 2019-03-26, ASTAP ß0.9.193 Adapted stacking for images with background above 32000. 2019-03-24, ASTAP ß0.9.192 Modified stacking routine. Image background will be brought to the same level (1000) prior to stacking. Modified native command line. Change -dec to -spd (south pole distance). Command line doesn't allows negative values. 2019-03-23, ASTAP ß0.9.191 Added a pop-up notifier for command line only. 2019-03-21, ASTAP ß0.9.190 Added gradient tool to pixel math. Fixed a problem with drizzle. 2019-03-16, ASTAP ß0.9.189 Fixed quality filter. Repeated analyse has no influence. 2019-03-16, ASTAP ß0.9.188 Added percentage to filter out worst images. Removed a solution check from blinking which caused problems. 2019-03-12, ASTAP ß0.9.187 Forcing delete of old solutions of new files in the browser to blink. 2019-03-7, ASTAP ß0.9.186 Fixed a failure reporting parameter in the PlateSolve2 report output. 2019-03-7, ASTAP ß0.9.185 Reduced search field using Platesolve2 commandline with factor 2. 2019-03-4, ASTAP ß0.9.184 Fixed a format problem with strings in FITS header. 2019-03-4, ASTAP ß0.9.183 Added a noise removal routine. Some minor adjustments. 2019-03-1, ASTAP ß0.9.182 Improved astroC demosaic method. Prevented clamping if colours are adjusted. 2019-02-27, ASTAP ß0.9.181 Improved bayer drizzle demosaic routine, fixed a problem in AstroM demosaic routine, added local monochrome and gaussian blur in mouse pop-up. Local monochrome is to fix colour problems in bright stars. 2019-02-22, ASTAP ß0.9.180 Allowed reading FITS keywords with string values other then start position 11. 2019-02-18, ASTAP ß0.9.178 Allow stacking of JPEG, TIFF files. For command line use of solver, FOV of fits file keys overrules specified FOV. 2019-02-17, ASTAP ß0.9.177 Fixed 16 bit monochrome PNG export. Added help for statistical filtering. 2019-02-16, ASTAP ß0.9.176 Added statistical filtering images. Added 16 bit PNG support. 2019-02-10, ASTAP ß0.9.175 Increased the speed by suppressing update memo in viewer while handling files. Changed some default settings. 2019-02-09, ASTAP ß0.9.174 Added background and noise level to darks en flats file list. Added 4x4mean for flats. Added "reset to default settings" menu option. 2019-02-08, ASTAP ß0.9.173 Added Bayer-drizzle demosaic routine. Fixed XISF reader for files with larger header. 2019-02-07, ASTAP ß0.9.172 Fixed a runtime error bug using astrometric alignment and flats or darks. 2019-02-06, ASTAP ß0.9.171 FIXED MAJOR BUG. FLATS WHERE NOT USED CORRECTLY IN THE LAST VERSIONS. Added AstroC demosaic routine for better saturated star color. Will work on a Bayer Drizzle demosaic routine in next version. 2019-02-05, ASTAP ß0.9.170 Fixed a run time failure in the OSC colour stack routine. 2019-02-05, ASTAP ß0.9.169 Improved remove deepsky routine. Added at pixel math an option to apply a flat (colour or mono) manually. 2019-02-04, ASTAP ß0.9.168 Added a routine to fix colouring of saturated stars. 2019-01-24, ASTAP ß0.9.167 Improved XISF reader. Modified create FITS header routine. 2019-01-24, ASTAP ß0.9.166 Adding copy image list information to clipboard. This allows export of FITS file keyword data such as HFD, temperatures, altitude, focuser position to a spreadsheet for analysis. 2019-01-22, ASTAP ß0.9.165 Extensive code optimisation. Added some extra messages for colour stacking. Added 64 bit float XISF import. Fixed FITS generation for PlateSolve2 substitute use. 2019-01-18, ASTAP ß0.9.164 Added possibility to read uncompressed XISF files. 2019-01-16, ASTAP ß0.9.163 Fixed/improved artifical flat-correction tool. Reorganised pixel math menu's. 2019-01-15, ASTAP ß0.9.162 Adapted the (star) saturation detection to the dark subtracted. 2019-01-15, ASTAP ß0.9.161 For manual alignment, changed behaviour for locking on objects. 2019-01-14, ASTAP ß0.9.160 Improved interface/handling of marked objects for manual alignment. So the object selection stays at the same place when you swipe/zoom. 2019-01-13, ASTAP ß0.9.159 Fixed a problem with manual stacking for seperate R, G, B files. 2019-01-11, ASTAP ß0.9.158 Added a check in the manual stacking to test if all images have a reference object selected. 2019-01-09, ASTAP ß0.9.155/6 Modified histogram and stack routine for colour due to some problems. 2019-01-08, ASTAP ß0.9.154 Fixed some colour problems, added background colour removal tool in pixel math. 2018-12-29, ASTAP ß0.9.151 Added de-mosaic method based on "HIGH-QUALITY LINEAR INTERPOLATION FOR DEMOSAICING OF BAYER-PATTERNED COLOR IMAGESHenrique S. Malvar, Li-wei He, and Ross Cutler"
2018-12-29, ASTAP ß0.9.150 Fixed some bugs for OSC images. 2018-12-27, ASTAP ß0.9.149 Improved code at many places. JPEG, PNG formats are now beter integrated. Improved solver. 2018-12-27, ASTAP ß0.9.148 Modfied space bar refresh. Was influencing typing image center position. 2018-12-21, ASTAP ß0.9.147 Added distortion tool. Several other small corrections. 2018-12-14, ASTAP ß0.9.146 Fixed live distance calculation. 2018-12-13, ASTAP ß0.9.145 Fixed solving JPEG images. 2018-12-09, ASTAP ß0.9.144 Released MacOS version with correct color and DCRAW integrated. 2018-12-08, ASTAP ß0.9.144 More menu improvements. 2018-12-07, ASTAP ß0.9.143 Some menu improvements. 2018-12-05, ASTAP ß0.9.142 Added the possibility to force the star database used. 2018-12-04, ASTAP ß0.9.141 Added importing PFM format (32 bit float export from Photoshop). Fixed a problem in PPM/PGM reading. 2018-12-04, ASTAP ß0.9.140 Mayor overhaul in stretching routine. Colour preserving stretching introduced. Faint stars and nebula keep now their colour. 2018-11-27, ASTAP ß0.9.139 Small changes, introduced artificial colouring function in pixel math. 2018-11-25, ASTAP ß0.9.138 Adapted solving for very large fields. Introduced cropping and "forge small search steps" for this. 2018-10-30, ASTAP ß0.9.137 Cosmetic changes. 2018-10-29, ASTAP ß0.9.136 Fixed some problems with file selection. 2018-10-29, ASTAP ß0.9.135 Fixed some problems with RAW files. 2018-10-29, ASTAP ß0.9.134 Allowing stacking of DSLR RAW files directly. 2018-10-27, ASTAP ß0.9.133 Improved help file and link. 2018-10-26, ASTAP ß0.9.132 Improved dark images handling for sensors with amp-glow. 2018-10-24, ASTAP ß0.9.131 Image dimensions in degrees is now also indicated after solving. 2018-10-11, ASTAP ß0.9.128, Improved equalising background for image stitching mode (mosaic). Fixed some small bugs. 2018-10-10, ASTAP ß0.9.127, Fixed PlateSolve2 command line for use with SGP or APT and DSLR cameras. Start position was only taken from FITs header not command line. Added log file called "documents\astap_log.txt" for PlateSolve2 commands only. 2018-10-4, ASTAP ß0.9.124, Stacking speed at least four times faster! 2018-10-2, ASTAP ß0.9.123, Made dark spot filter permanent active. Improved the dark spot filter. 2018-10-1, ASTAP ß0.9.121/122, fixed a problem combining colours with one rotated. 2018-10-1, ASTAP ß0.9.120, added the possibility to add a pedestal value to the final stack result to prevent negative values. 2018-9-29, ASTAP ß0.9.119, Fixed a tiny error (1,5 pixels) for center position calculated by the solver. 2018-9-28, ASTAP ß0.9.118b, Gained 1% astrometric solving speed by stripping some code in star database read routine. Note that the 32 bit version performance 66% slower in a 64 bit system. So download the 64 bit version if your system is 64 bit. 2018-9-27, ASTAP ß0.9.118, Fixed a bug in reading star database for finding astrometric solution, slower speed but increased reliability. 2018-9-25, ASTAP ß0.9.117a, PlateSolve2 mode, program waits with closing till apm file is existing on disk. 2018-9-25, ASTAP ß0.9.117, Optimized magnitude control loop. Solving about twice as fast. 2018-9-25, ASTAP ß0.9.116, Optimized star detecting algorithm using images from Astrometry.net upload. 2018-9-24, ASTAP ß0.9.115, Added the -s and -t command line option. Added some checks for file handling. Writes and additional .ini file in PlateSolve2 command line mode for debugging. 2018-9-21, ASTAP ß0.9.114, Perfected search pattern in the sky removing any duplication. 2018-9-20, ASTAP ß0.9.113, Bug fix edition. Achieving blind solve of a 50 seconds exposure with an offset of 180 degrees distance in 380 seconds! 2018-9-19, ASTAP ß0.9.112, Adapted -32 bit fits reader to 0..1 scale. 2018-9-19, ASTAP ß0.9.111, Relaxed on double star detection. Some minor fixed and added some hints. 2018-9-16, ASTAP ß0.9.110, Fixed a slow down by star detection. 2018-9-16, ASTAP ß0.9.109, Fixed some other problems. 2018-9-16, ASTAP ß0.9.107, Fixed binning. 2018-9-16, ASTAP ß0.9.106, Mayor overhaul in solving engine. Introduced down sampling/binning. Numerous small improvements. 2018-9-12, ASTAP ß0.9.105, Increased accuracy of angle reported by the internal solver. Fixed bug in saving 16 bit images for values above 32k. Added caret indication for fits header. Many small improvements. 2018-9-7, ASTAP ß0.9.104, added test image generation in pixel math. 2018-9-4, ASTAP ß0.9.103, added a warning for the case that a restore hot-pixels is used and too many pixels are restored. This could happen for cameras with amp-glow. 2018-9-1, ASTAP ß0.9.102, some cosmetic improvements. 2018-8-29, ASTAP ß0.9.101, improved file naming. 2018-8-29, ASTAP ß0.9.100, code optimisation. 2018-8-29, ASTAP ß0.9.99, Added two new filters for LRGB color images. The 3x3mean and 2x2mean. The 3x3mean works wel. 2018-8-28, ASTAP ß0.9.98, Fixed some things in astrometric stacking. 2018-8-27, ASTAP ß0.9.97, For Windows moved astap.cfg from documents folder to to \user\username Fixed a problem plate solving twice. 2018-8-24, ASTAP ß0.9.96, Fixed FWHM calculation. Improved HFD calculation for faint stars. 2018-8-22, ASTAP ß0.9.95, Viewer improvements. Preserving now the plate solving in case the image is cropped. Memo containing the FITS header is now updated instantly in case image is cropped or made mono. Ctrl-Z is also restoring the FITS header. 2018-8-18, ASTAP ß0.9.94, Added colour annotation of stars if G16 star database is present. Remove G17. 2018-8-16, ASTAP ß0.9.93, Added experimental photometry option to the viewer. After plate solving, select calibration photometry in the viewer tools menu. This will allow magnitude measurement of the stars. The magnitude values is displayed in the status bar. The G17 database will give BP magnitudes for unfiltered mono CCD's. If replaced by the G16 and a Johnson-V filter is used it will give Johnson-V values. Works for mono/red channel only. 2018-8-14, ASTAP ß0.9.92a, Minor text and hint updates. 2018-8-13, ASTAP ß0.9.92, New blink routine. New alignment option to calibrate images only. Some minor menu improvements. 2018-8-05, ASTAP ß0.9.91, Some minor menu improvements. 2018-7-31, ASTAP ß0.9.90, Added some functions to pop-up menu of the thumbnails viewer. 2018-7-30, ASTAP ß0.9.89, Added thumbnails option for viewer. 2018-7-27, ASTAP ß0.9.88a, Fixed some text labels in the Linux version. 2018-7-27, ASTAP ß0.9.88, Minor correction in the menus. 2018-7-22, ASTAP ß0.9.85, Fixed a fatal problem in sigma clip stacking. 2018-7-19, ASTAP ß0.9.84, Fixed a run-time problem with de-mosaic Bayer. Introduced manual alignment. 2018-7-16, ASTAP ß0.9.83, Added super-pixel option for demosaic RAW OSC images. 2018-7-14, ASTAP ß0.9.82, Added split function for RAW Bayer array images. This will split them into seperate R,G,G, B files. 2018-7-14, ASTAP ß0.9.81, Fixed conversion routine for digital cameras using DCRAW. 2018-7-13, ASTAP ß0.9.80, Mayor update. All darks, flats and bias will automatic processed into masters. Activate classify by dark temperature, exposure and flat field filter. 2018-7-6, ASTAP ß0.9.79, Added log file which will be written after stacking. 2018-7-4, ASTAP ß0.9.77, Added export to 16 bit PGM and PPM format. Several small improvements. 2018-7-3, ASTAP ß0.9.76, Added PGM and PPM format. Added DCRAW program by David Coffin for conversion of many camera files. 2018-7-2, ASTAP ß0.9.75, Modified & improved LRGB stacking method. Stars are removed from the RGB stack using the most common filter. Then a Gaussian blur is applied with the same factor to remove any square artifacts if any. Fixed a severe problem with uppercase .FIT extension. Added image to FITS conversion tool. Fixed a color stacking problem introduced a week ago. 2018-6-30, ASTAP ß0.9.74, Improved mosaic mode. Some menu improvements. 2018-6-29, ASTAP ß0.9.72, Improved mosaic mode. Some menu improvements. 2018-6-28, ASTAP ß0.9.71, Fixed background routine. Change introduced in v0.9.68 didn't work. 2018-6-26, ASTAP ß0.9.69, Added star annotation. See tool pulldown menu. 2018-6-26, ASTAP ß0.9.68, Fixed missing colour for LRGB stacking. 2018-6-23, ASTAP ß0.9.67, Fixed problem applying oversize twice. 2018-6-22, ASTAP ß0.9.66, Improved mosaic mode. Introduced drizzle. 2018-6-16, ASTAP ß0.9.65, Fixed some menu problems for stacking, improved RA, DEC indication, added shutdown after completion option. 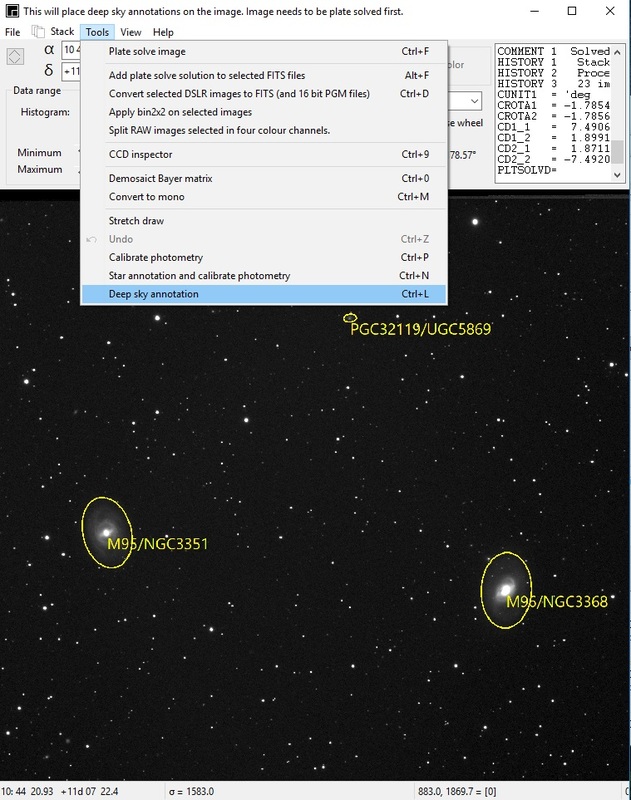 2018-5-26, ASTAP ß0.9.64, Fixed annotation for flipped images (newton style telescopes), and detection missing star database. 2018-5-18, ASTAP ß0.9.59, Introduced deep sky annotation under pull-down menu tools. 2018-5-18, ASTAP ß0.9.58, Some improvement for stacking. 2018-5-16, ASTAP ß0.9.55, Fixed some problems for color image stacking. 2018-5-14, ASTAP ß0.9.54, Stack menu improvements. 2018-5-13, ASTAP ß0.9.53, Introduced dark spot filter for CMOS stacked images. 2018-5-13, ASTAP ß0.9.52, Fixed scroll bars stack menu. 2018-5-12, ASTAP ß0.9.51, Added the FITS preview option to the file open dialog. See below. Fixed standard deviation indication. Fixed gamma setting when loading an image. 2018-5-11, ASTAP ß0.9.49, Fixed several small items for stacking. 2018-5-8, ASTAP ß0.9.48, Adapted for the new Gaia DR2 database. It will work with U16, G17 or G18 database. 2018-5-3, ASTAP ß0.9.45, Fixed the Platesolve2 command line. 2018-4-30, ASTAP ß0.9.44, Several small improvements. 2018-4-28, ASTAP ß0.9.43, Plate solve improvements for images going very deep. So speed improvements plate solving. v0.9.41 and 0.9,42 have a bug for large amount of stars. 2018-4-27, ASTAP ß0.9.40, Many small improvement. Improved reliability. Introduced overlap based on the number of pyramids in the image. 2018-4-26, ASTAP ß0.9.39, Small improvements in plate solving . Added a check on number of stars and pyramids in image. 2018-4-23, ASTAP ß0.9.36, Improved speed conversion PNG, JPG, TIF to FITS. 2018-4-22, ASTAP ß0.9.35, Modified PlateSolve2 simulation. 2018-4-21, ASTAP ß0.9.34, Removed PlateSolve2 dependency. Rename the program to PlateSolve2.exe will work using the internal solver. So full replacement for PlateSolve2. For a 30 degrees offset if will find a solution after 4 minutes or earlier. 2018-4-20, ASTAP ß0.9.33, Fixed some detections levels for plate solving. 2018-4-19, ASTAP ß0.9.32, Added adjustable minimum number of pyramids required. Typical value for stacking 6 and just plate solving 3. 2018-4-19, ASTAP ß0.9.31, Fixed application path to the U16 files. 2018-4-19, ASTAP ß0.9.30, Added internal plate solver. 2018-4-18, ASTAP ß0.9.29, Improved alignment. 2018-4-16, ASTAP ß0.9.28, Improved alignment. Checking for outliers. Scaling factor no longer required. 2018-4-12, ASTAP ß0.9.27, Improved log in FITS header. Fixed some bugs. 2018-4-12, ASTAP ß0.9.26a, Added some image info to the status bar. Introduced Windows installer. 2018-4-10, ASTAP ß0.9.26, Automatic sorting of lights, dark and flats. Pop-up menu has option to update keywords of multiple files. Free sizing of FITS files and noise generator in pixel math. 2018-4-9, ASTAP ß0.9.25a, Allowing filtering on exposure & temperature for darks and filter for flats. 2018-4-5, ASTAP ß0.9.23c, Allowing file name as parameter with spaces. So you set ASTAP as default viewer for FITS, PNG, TIFF, JPG. Improved reporting in FITS header. 2018-4-3, ASTAP ß0.9.22, Several improvements. Allowing combing colour images with H-alpha. 2018-4-2, ASTAP ß0.9.20, Fixed Gaussian blur in LRGB stacking. Fixed runtime error in saving flats and flat darks. Fixed sigma clip stacking for LRGB. 2018-4-2, ASTAP ß0.9.18a, Fixed 16 bit saving. 2018-4-1, ASTAP ß0.9.18, Fixed regional settings. Ignore space character object name aand filter name. Fixed RGB+L stacking. 2018-3-31, ASTAP ß0.9.17, Several fixes LRGB stacking. Fixed color model LRGB stacking. 2018-3-30, ASTAP ß0.9.13b Big overhaul in stack menu. Now you can stack several objects in one run. RGB and LRGB stacking is also possible. Files in listview menu can be selective removed, added or stacked. Program uses now images with lowest HFD as reference. 2018-3-23, ASTAP ß0.9.12 Overhauled star detection and image inspector. Improved menu of image equalising. 2018-2-20, ASTAP ß0.9.5 Small improvements. 2018-2-19, ASTAP ß0.9.4 Several small improvements, oval shape selection area for removal deepsky. 2018-2-16, ASTAP ß0.9.1, Added tilt measurement to CCD inspector, Added background equalization tool under pixel math. 2018-2-14, ASTAP ß0.9.0, Improved vieuwer low, medium, high settings. 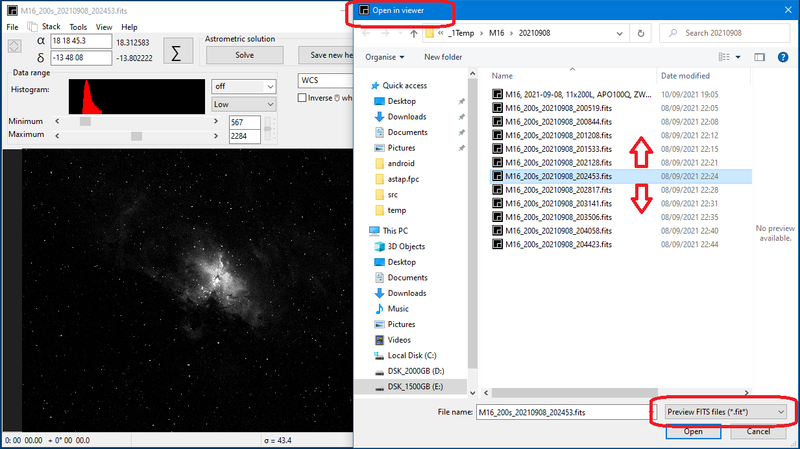 Fixed deleting files of astromentry.net. 2018-1-15, ASTAP ß0.4.4, Added multi selection in image list. 2017-12-17, ASTAP ß0.4.3, Improvement in CCD inspector and image analyser. 2017-12-16, ASTAP ß0.4.2, Added CCD inspector. Fixed image analyser problem. 2017-12-16, ASTAP ß0.4.1, Added access to Astrometry.net running in a Win10 Linux subsystem. 2017-12-12, ASTAP ß0.4.0, First release Linux version, Several improvements. 2017-11-30, ASTAP ß0.3.0, Several improvements. 2017-11-30, ASTAP ß0.2.2, Several improvements, introduced median-equalise filter. 2017-11-29, ASTAP ß0.2.0, Several improvements. 2017-11-24, ASTAP ß0.1.5, Added mosaic equalise background mode. 2017-11-23, ASTAP ß0.1.4, Added sort possibility to image list. You can sort on HFD or any other column. 2017-11-21, ASTAP ß0.1.1a Fixed some minor things. Simplied pixel size for astrometry.net solver. 2017-11-20, ASTAP ß0.1.1 Many small improvements. CMD console is now monitored and if closed action is taken. 2017-11-19, ASTAP ß0.1.0 Added SIP (Simple Imaging Polynomial) support, Write FITS files as multiple of 2880 bytes. Fixed several small things. 2017-11-17, ASTAP ß0.0.9a Fixed color conversion using astrometry.net, added the header from first FITS to stacked image. Log follows resizing of stack menu. Improved Windows interface,. Adaption to PixInSight -32 bit files. 2017-11-16, ASTAP ß0.0.8 Fixed some problems including using PlateSolve2. 2017-11-15, ASTAP ß0.0.7a Fixed Digital development Process for color and some small improvements. 2017-11-13, ASTAP ß0.0.7 Improved viewer menu and performance. Improved export routine including streched TIFF files and variable JPEG compression. Select the correct file in file dialog. 2017-11-12, ASTAP ß0.0.5 New dark filter. 2017-11-11, ASTAP ß0.0.4 Added a FITS crop function using the right mouse button. 2017-11-10, ASTAP ß0.0.3 Fixed a dark subtraction problem in mode average. 2017-11-10, ASTAP ß0.0.2 New name ASTAP. Added digital development and several other improvements. 2017-11-8, ASTAP ß0.0.1 Added Astrometry.net local and several improvements. 2017-11-5, ASTAP ß0.0.0e Fixed regional decimal seperator problem. Back to the ASTAP page.